This is the first post of two on the subject of changes in publishing. I came across an interesting post by Jane Friedman on the subject, based on a Nielsen presentation by Jonathan Nowell. Studying the last decade, one can reach a number of interesting conclusions. When looking at the graph below, it’s interesting to remember that the first Kindle was released in late 2007, while 2011 saw the release of Kindle Fire. Fiction ebook sales: Romance started off as the strongest genre in ebook format, and has remained dominant since. Today it constitutes 24% of all ebook sales. 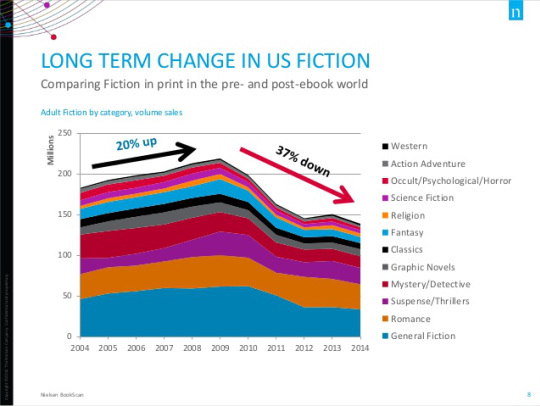 Fiction print sales were up 20% from 2004–2009, and have decreased 37% since then (as a result of ebooks picking up momentum). In the latest quarter, adult fiction accounts for 65% of ebook sales. Overall U.S. print book sales in 2014: 37% juvenile, 23% adult fiction, and 40% adult nonfiction. A separate survey has shown that 80% of YA purchases are by adult readers, for adult readers. Part of the appeal for adults seems to be that YA is fast-paced and quick to read—you can finish a book in a day. 2008, the last Kindle-free year, was a peak one for adult fiction. Since then, romance titles have remained pretty steady. However, general fiction has dropped significantly, especially between 2010-2012. The same is true of Mystery/detective, only the squeeze here started in 2009. Other genres that have slumped include Fantasy, Science Fiction and Occult/Psychological/Horror. Do e-book fiction sales cannibalize print fiction sales, then? Not necessarily. From 2008–2010, three mainstay fiction authors sold 27 million print units collectively. From 2010–2012, they sold 23 million print units PLUS 28 million e-book units. As for nonfiction print book sales, they were up 18% from 2004–2009, and have decreased 23% since then. The hardest hit categories: travel (-50%) and reference (-37%). The flourishing categories: religion/Bibles (+43%) and cooking/entertaining (+11%), the latter specifically driven by celebrities. The juvenile category (which includes YA) had its best sales year ever in 2014. Sales are up 12% from the prior year. If you’re interested in further information, the slide pack from Nielsen is full of fascinating data, so feel free to take a look, or read Jane Friedman’s original post for more! The next post will deal with the recent release of the Publishers Association’s Statistics Yearbook 2014. If all these numbers give you a headache, why not read my award-winning children’s book, Runaway Smile, for free to clear your head? Something that isn’t addressed in the graph is gay and lesbian fiction. E-books became very popular, because no one could see WHAT you were reading on your Kindle. This may change with the mainstreaming of gay and lesbian characters into popular fiction. Thanks Nicholas. It seems I might have made a good decision to split my fantasy novel into smaller volumes when it was heading past the 120,000 word mark. As to e-books, I didn’t think I would take to them so well, but I love my tablet and love the ease of holding it to read, not to mention the lighting. This is fascinating. I would not have thought that YA is read by so many adults, but it does make sense that in this fast-paced world, people would opt for quick reads. I wonder what the numbers are for short story readers – up or down? I suspect that may be why romance is popular: short, fast reads. Very true. I have a friend who’s a romance author. She’s currently rewriting her debut novel, with the explicit aim of making the language easier. That may be true, but most are feel good reads, too. I think that is part of the draw. That’s why I don’t review teen books. I can’t get into any of the above. My grandsons read nothing but dystopian. True! Still, Edgar Allan Poe, Nathaniel Hawthorne, and William Wordsworth are studied in school, with Poe being the most popular. Fascinating post and analysis. Thanks! 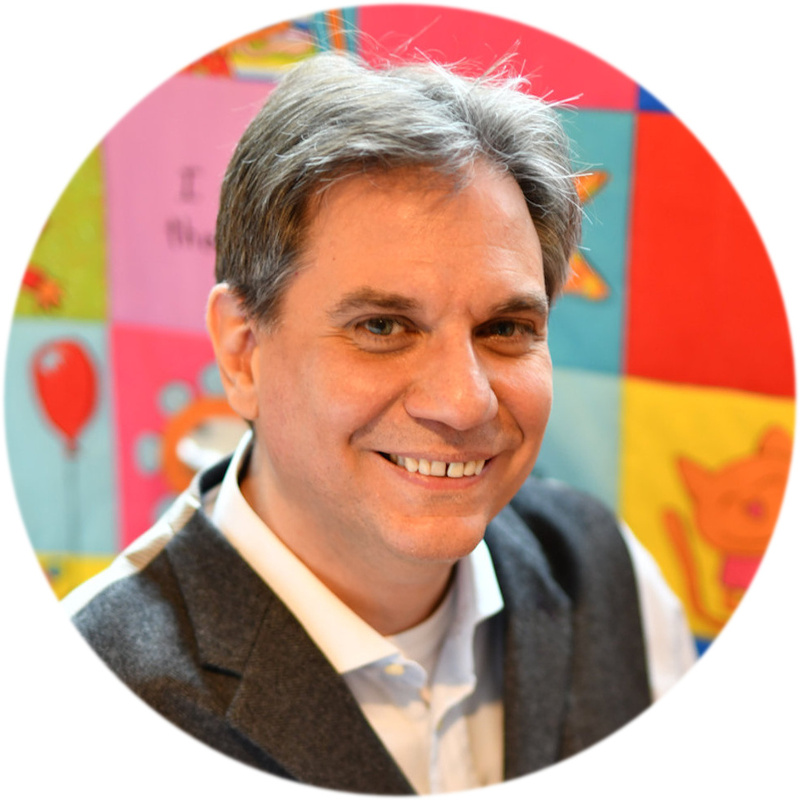 I read in Secrets to Ebook Publishing Success (the author is the founder of Smashwords) that the ebook revolution has yet to hit most countries outside the United States, BUT that the trend is growing and will explode just like it did in the US. I know. Plus, there always seems to be another trend down the line. I mean, Rubic’s cube, anyone? Reblogged this on Armand Rosamilia. This is great news, IMO. I couldn’t live without my e-reader, read all of my books on screen. My husband, on the other hand, refuses to get with this century and needs to hold a physical book. Hey, at least he’s reading, right? Interesting look at the statistics for book sales based on the last ten years and looking at print vs. Ebooks and also individual genres.. courtesy of Nicholas Rossis​ thanks. Fascinating numbers. I still root for real paper books. I have many downloaded on my Kindle but avoid reading electronic books, although I like the convenience of having a library in my purse. Wow, I didn’t realize that. Thanks for the info. That’s a great way of looking at it! I’m reminded of various studies that show how the commons scare of people no longer reading don’t take into account changing technologies. For example, a large number of people nowadays read on their mobile phones. Great information, Nicholas! Thanks for sharing and have a great weekend! Interesting how romance is routinely at the top. I wonder if that shows there are more female readers. Kind of like how you would find the Harlequin romance displays in stores, but nothing like that for guys. Do you think the ‘romance sale superiority’ trend has been going on longer than people realize? Same here. I barely pay attention to the current trends. Just typing away at my own little world, which might not be the best idea. Keep getting told that I need to be more businessman than artist. Is it really that sad? “I frequently browse the Amazon best-seller list, trying to locate self-published books among the likes of James Patterson. It’s easy to spot them from the cover: half-naked guys. What I do next, is see if the author has published two dozen books before. Most of the times, she has. 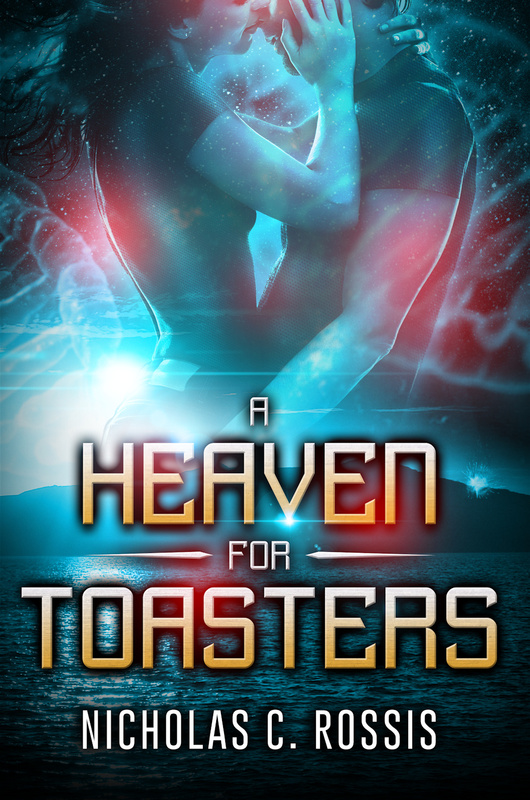 But there are times, as is the case with Kim Linwood, where you get a first-time author who self-publishes a book and gets the kind of sales that earns her some 100K month. Wow. I really don’t know what to think about that. Honestly, part of me wants to get a beer for some reason. Only other things here are vodka and bourbon. Also some really harsh whiskey. It is always good to see figures confirming feelings. I had always asserted that serious readers would continue to buy real books, especially in the case of non-fiction. I have also always been aware (though constantly surprised) that romantic fiction was consistently dominant, but I am pleased to see the increase in the youth market, and to know that they are still reading. Best wishes from England. Pete. That’s exactly why I love hard data, Pete! You may have a hunch, but until you see some supporting evidence, it’s hard to know just what’s going on. Yes, that was quite surprising, wasn’t it? What constitutes an “adult,” however? I find people in their early twenties read them, but usually not 40-year-olds! Working in a bookstore, my surprise is how many teen girls buy hard copies rather than eBooks. Interesting! Yes, the borders, so to speak, don’t seem to be fixed.